When I used to live in Mexico, I had the opportunity to cook over 40 turkeys (not all at once, because that would be crazy). 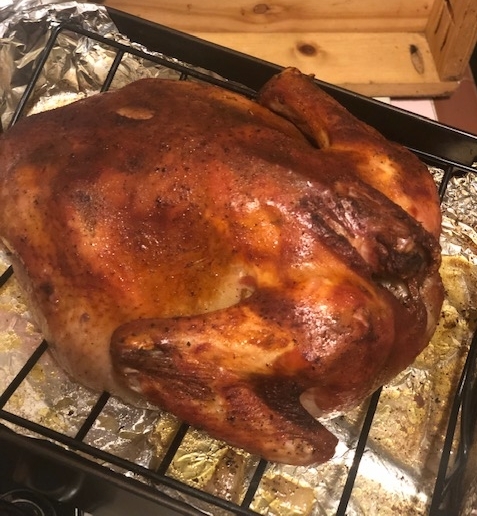 Since I hadn’t ever cooked a turkey before and the ones that I had eaten at Thanksgiving were dry and flavorless, I was determined to figure out how to make moist and flavorful turkey. Below is how I make our turkey every year and sometimes multiple times per year because this turkey is that good. My favorite way is to get a big pot (if you can fit your turkey in it AND fit the whole pot in the fridge, or use a cooler (make sure it is very clean). This is my brine recipe, but you can use any brine recipe. The important part is that your turkey actually sits in the brine for 12-24 hours. Unwrap your thawed turkey and rinse it. Put it in your pot or cooler. Then add a couple of beers. I used some low fills that were sitting in the cold room at the brewery. You can use something that someone left behind and you’re not a big fan of. If you don’t have beer you want to spare for this brine, add a couple of tablespoons of apple cider vinegar. It will help lower the pH of your brine and help your turkey to be more flavorful. In a blender, combine some of the bone broth and garlic to blend a make a garlic smoothie. Add this to your pot. Add the rest of your broth. Then add the salt water. I like to do 1/2cup of salt (dissolved in water first) per 1 gallon of water. However, I don’t like to use more that 1 1/2 cups of salt total or else it makes it too salty. As long as the turkey is flavorful, you can always add a touch of salt later. Make 1 gallon of salt water at a time until the turkey is fully submersed, then put the pot in the fridge and let the brine due its magic. If you use a cooler, you’ll need some ice in your brine to keep your turkey cool. Pull your turkey out of the brine and give it a good rinse. Set your turkey on a rack in the roasting pan. If your roasting pan doesn’t have a rack, just use a little foil to make some foil balls to prop the turkey up so it is not touching the bottom of the pan. The key is to set your turkey BREAST DOWN. This is opposite most pictures because when the bird is breast up, you can stuff it and make it look pretty. Breast down will still look pretty and then just do the stuffing on the side. If you don’t know how to tell if its breast down, then make your bird pretend to fly and if the wings are right, then your breast is down. Stuff your turkey with lemon, garlic, onion, rosemary, or any other herbs your want to use. I love this combo but have also added an apple or orange, some basil or tarragon fresh from my garden. Some of it will fall out, that’s ok; it will just make the drippings on the bottom taste good for gravy. Drizzle melted butter over the top (or if there are dairy allergies in your family then you can use olive oil or avocado oil). Sprinkle top of the turkey with salt, pepper, oregano, and paprika (to make it look pretty). Pour 4 cups of water in the bottom of the roasting pan. Pre-heat the oven to 425F. Place your turkey in the oven and cook at this high heat for 30 minutes. Then lower the temp to 325F but don’t open the oven. After 20 minutes with the temp at 325F, open the oven and baste the turkey with the juices from the bottom of the pan. Then set your timer for another 20 minutes and baste again. Repeat this basting procedure every 20 minutes the entire rest of the time it takes to cook your turkey. Carefully monitor the temp of your turkey with an oven safe thermometer and cook until the thickest part of the breast reads 152F. Yes, I know that everything you read says to cook it to 165F, but technically it only needs to be at 165F for a split second to be safe. It can be at a lower temp as long as you hold it there for a while. So once your turkey is 152F, pull it out of the oven and cover with foil and a couple towels (to hold in the heat) and let your turkey rest for at least 30 minutes (it can rest longer if you’re still a little ways off from eating dinner). Plan on about 12-15 minutes per pound. If its cooking a little slow, you can up the temp to 425F again, but baste it more often. About a half hour before dinner is served, carve your turkey. Enjoy this amazingly moist and flavorful turkey with Lickable Staves and friends. Now that San Diego Beer Week is over, it feels like the holiday excitement can begin. Although I’m not quite ready for Christmas music (I’m a strict “no-Christmas-music-til-after-Thanksgiving” person), I am ready for cold nights, dark beers, and all things pumpkin. I also love how these holidays encourage friends and family to gather to enjoy a meal together and catch up on life. Every year on the last day of Beer Week, the Council Team gathers to share a meal, open up some bottles/cans, and talk about our favorite highlights from the whole week. Below is the Pumpkin Bread recipe I made to share. 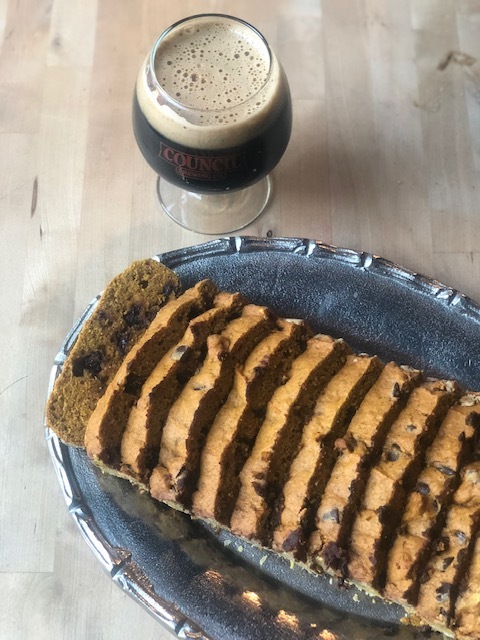 If you like chocolate chips in your pumpkin bread, I would suggest pairing it with our Robust Porter or Wayward Penguin (milk stout with cocoa nibs and vanilla). If you like your pumpkin bread with a touch of butter, I’d suggest pairing it with Magicdor (a rustic wild ale). -In a large mixing bowl, blend together semi-melted butter and sugar. Add the eggs and pumpkin and continue blending until fully combined. Note: this is a reduced amount of sugar from a recipe I loosely follow since I prefer my pumpkin bread to be more sweet bread like than pumpkin cake like. -Add the flour, salt, baking powder, baking soda, cloves, cinnamon, and nutmeg on top of your butter mixture. Stir the flour mixture first, and then combine with the butter mixture from the bottom of the bowl. Note: this type of recipe you can get away with just using one bowl (because who wants to wash more dishes). However, if you want to use two bowls, mix all the dry ingredients in a separate bowl and then add to your butter mixture. Once all combined, fold in your chocolate chips (optional). -Prepare your pans (two 4” x 8” bread pans for 2” high bread, or just one pan for a larger loaf) by smearing with butter or non-stick cooking spray and dusting with flour. Scrape your batter into the pans. -Bake at 325F for 60-75 minutes (or until a toothpick inserted comes out clean). Remove from oven and set on a wire rack to cool for 10 minutes. Then turn out onto a wire rack to cool completely. -Enjoy with friends and beer! Pumpkin Bread fresh out of the oven! Curtis and I have been asked quite a few times over the years when we were going to expand. Our answer has always been that we've wanted to build a strong foundation defined by great beer (both clean and sour), great company culture created by amazing staff, and an aweome customer base. With a strong foundation, we could build upon it to make a lasting company. This last year we have explored several options to make more beer and expand but nothing seemed to work out for the long term. Then while reading a West Coaster article just a week and a half ago (Friday afternoon March 9th) we saw that Finest Made's brewery/tasting room in Santee, CA was available as a turnkey brewery. After thinking it over, we called the broker and inquired further. He informed us there were two other offers on the table and if we were interested, we needed to look at it that afternoon. It sounded too good to be true so we dropped what we were doing and went to go see it. It was beautiful. Almost brand new Glacier 7bbl, 3 vessel brewhouse with automation, (5) 30 bbl unitanks, (2) 15 bbl unitanks, (1) 7 bbl tank, and everything we would need to make more Council beer. I think my favorite part was the rakes in the mash tun! We revisited it the next day with some trusted advisers to take one more look at it. We placed an offer and an hour later, we got a call from the broker informing us our offer had been accepted. Now, just over a week later, we have the keys! We bought the assets of Finest Made Ales (not their brand). We also simultaneously took over their lease (signed a new lease with the landlord). We are currently in the middle of transferring their ABC license and getting our TTB license and all the other paper work needed for opening a new location. Once we have that (which will probably take at least 60-90 days) we will open the tasting room. We wish the ownership of Finest Made Ales the best, it's always sad when a brewery doesn't make it. We are excited to be able to make more beer. Most of the beer produced in our Santee brewery will be IPA's. We will be bringing in a mobile canner temporally until we can order our own to continue our rotating IPA can series. We will also be able to expand our ability to brew collaborations with others. We already have a couple collaborations lined up to brew and barrel-age there, and then eventually can. To clarify, this will be "clean" beer only (all wild yeasts and bacteria will stay in the Magic Factory). We are also excited to have another tasting room where conversations can be had, relationships can be developed, and customers can turn into friends. We have always seen Council as a place to bring people together. We plan to keep a wide variety of styles on tap with a bigger emphasis on some more light/easy drinking beers such as our Lively Banter Blonde and our Spreckels Hefe. We're also bringing our extensive sour beer program to East County which will be a really unique differentiation for us, plus we will also have our Magic Booch-Kombucha on tap. This opportunity feels like we've come full circle. We lived in Santee before starting Council Brewing and sold our house there to fund our current brewery and tasting room. Now we are back! Modern Magic, a Golden Sour Ale, Aged in Oak Foeder with Tangerines, Peaches, Nectarines, and Vanilla Beans.